I’ve already laid out all the pattern pieces on all 10 panels, so I know more or less where to place them, but I’m going to check again as I cut each piece. 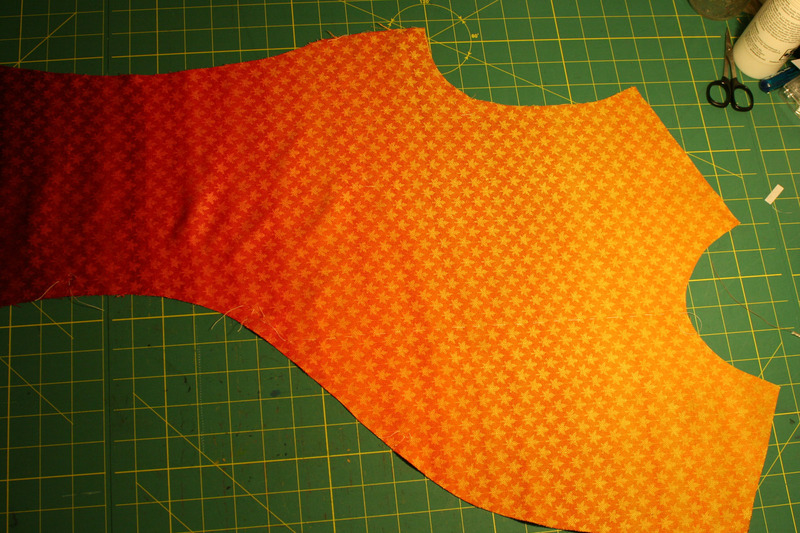 Â I’m also planning on thread-tracing the seamlines, so I know exactly what to match to what. Â It’s laborious but I think it will help the precision of my curved piecing, and will make it possible to “see” the cut piece before the scissors come out. Â I’m going to use a stiletto wheel and white dressmaker’s carbon paper to mark the seamlines, thread-trace them, and then do one final comparison of adjacent pieces, before cutting, so I can make sure that yes, really and truly, I have the adjustments right. Â Paranoid, perhaps, but it’s really important to me that it be “just so”. I expect this will take me a couple of mornings, but I want to make sure I have everything down before I start to sew. Â Wish me luck!